It is possible to harness the power of peers to improve collaboration in the workplace. Stronger collaborative leadership is fundamental to achieving progress and innovation. Collaboration seems so simple, yet is too often elusive. Disinterest, competing agendas and turf wars disrupt the opportunity to collaboratively create complex responses for complex problems. Smart people do a great job on their own. That’s good for work that requires individual effort. With so much work now interdependent, that simply is not enough. The evidence is clear that high performance in groups is not about the smartest person in the room. The average intelligence of group members and the intelligence of the smartest group member do not strongly correlate with group performance. Shared work tasks take longer and are harder than they need to be, because petty power plays rule. Too much time is spent fighting over who has higher status. This harms the ability of groups to work together. Shared commitments won’t stick in such an environment. Organisations still have a long way to go in better managing collaboration capability, demands and quality. In their study of a US Fortune 500 technology company, Cross, Rebele & Grant found that 60% of workers wanted to spend less time responding to ad hoc collaboration requests, which they felt exhausted by. However, 40% wanted to spend more time training, coaching, and mentoring. It was not the amount, but the quality of interaction that really mattered. After contributions were adjusted to align with these preferences, the employees were less stressed and more engaged. Yet few organisations are reaping the benefit of quality peer interaction. Most prioritise their efforts to increase engagement on either organisation-wide or leader-led strategies. Some see the potential in peer collaboration, but few are leveraging it. Provide little systematic opportunity for high quality peer interaction; there’s too much focus on low value meetings and decision-making processes that require multiple interactions for questionable gain. The net result is that peers don’t collaborate, they compete, they reinforce their silos and protect their turf. And end up feeling exhausted and unproductive. Gain clarity about the critical success factors for peer collaboration. Take a fresh perspective on the dynamics of power, and how to use it to create shared outcomes. Try out tactics for increasing personal authority in complex group dynamics. Prime for success in collaborative interaction. Create an action plan for increasing collaborative power. 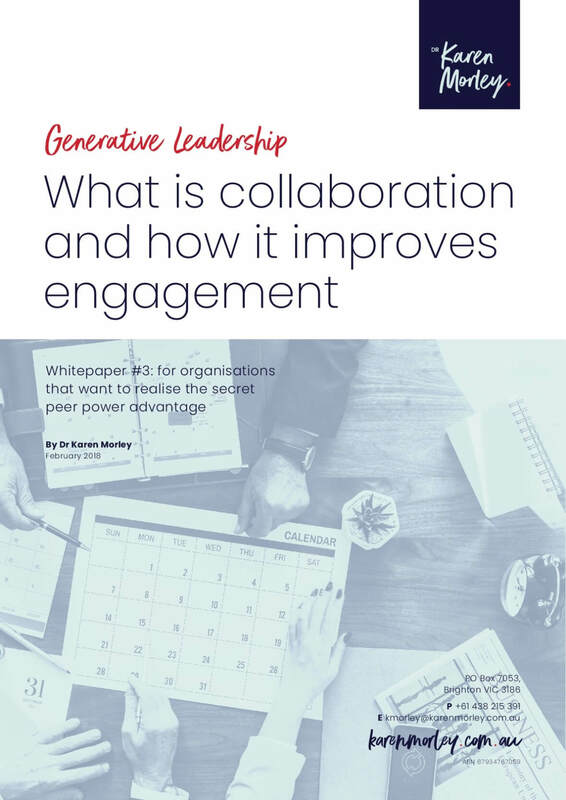 Whitepaper #3 describes how to create advantage through peer collaboration. It will help you to take practical steps to improve collaboration. Enquire about the 1 day Power, Authority & Collaborative Leadership Workshop.